Community Event: “Death Cafe” – Saturday 12th January 2019 – 2 pm to 4 pm. Join the conversation at Death Cafe Taunton @ Ciccic. Death Cafe Taunton is an opportunity to discuss all aspects of death in a relaxed atmosphere, with hot drinks and cake. What is Death Cafe? It’s a global movement to increase awareness of death with a view to helping people make the most of their (finite) lives. There is no agenda or judgement. It is a discussion group rather than grief support or therapy. Anyone can can come talk about any aspect of death and dying, from our own experiences with death to funeral plans. 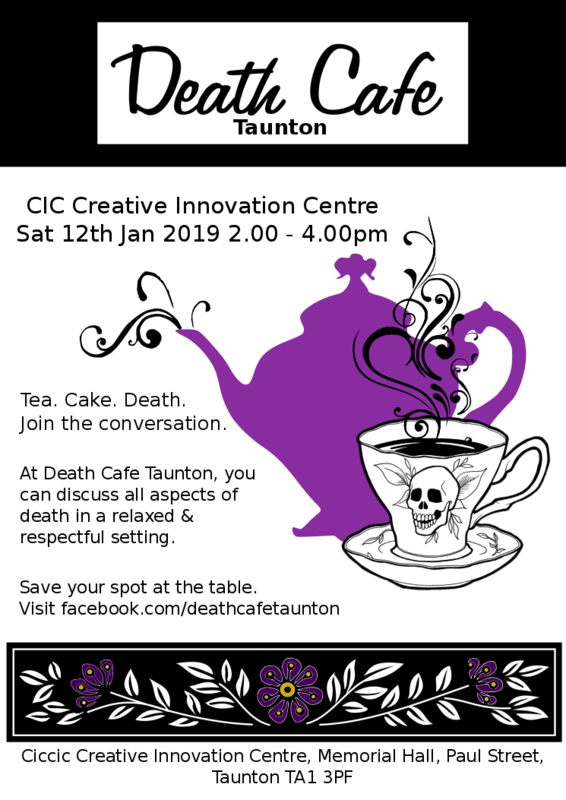 At Death Cafe Taunton at the Creative Innovation Centre, you will find a safe and respectful setting to discuss death, celebrate life, and of course, enjoy a hot drink and delicious cake. Admission is free, but there will be refreshments for sale during the cafe. Save your place at the table as spaces are limited!